Engineering.com presents a really interesting (i.e. a conversation starter) infographic on the relative merits of the five categories of CFD software: Open-Source, Open-Source Wrapper, CAD-Integrated, Specialized CFD, Complete CFD. What do you think about the five categories? Would you have organized CFD software that way? Open-Source Wrapper has “Little user support” – Anyone care to take the bait? Specialized CFD has complex licensing unless there’s a “token system” – I’m not even certain what that means. Monica Schnitger reports that ESI has been having good financial success recently. Enjoy all the nominated and winning posters from the International CAE Conference. How might CFD provide insight into the brewing of beer? Image from Simscale. Click image for article. ThermoAnalytics’ 2017 Global User Group Meeting will be held 27-30 March 2017 in Southfield, MI. Conference proceedings from the 2016 FLOW-3D Americas Users Conferences are now available. The abstract deadline for the STAR Global Conference 2017 is rapidly approaching. Submit yours by 30 November. Ercoftac is offering a 2-day course on High Order Methods for Industrial CFD on 03-04 November 2016 in Brussels. A supersonic CFD simulation from Spike Aerospace computed with STAR-CCM+. Image from Digital Engineering. See link below. Watch this video demonstration of how NURBS geometry can be directly edited in CAESES for a ship hull. Digital Engineering Magazine wrote about Spike Aerospace’s use of CFD in their design of a supersonic business jet. See image above. CFD for spacecraft launch vehicle design. CFD for student use on design of their Formula SAE cars. CFD for wind on buildings. Speaking of CFD for buildings, Fire Design Solutions will be using CFD to simulate smoke ventilation systems for a skyscraper. CFD helps properly orient offshore drilling platforms. TwinMesh shares this validation study of CFD for a twin screw expander. Image from TwinMesh. Click image for article. OpenQBMM 2.0.0, an open-source implementation of Quadrature-Based Moment Methods built on OpenFOAM, is available on GitHub. Caelus 6.10, an open-source derivative of OpenFOAM, was released with robustness and performance improvements to the linear solvers. EnGen is cloud-based CFD from ThinkSOLN. RhinoResurf v2.007 was released for reconstructing NURBS geometry from scan data. Speaking of scan data, Elysium and DotProduct announced a tablet-based tool for going directly from scan to CAD, InfiniPoints DP. Beta CAE announced v16.2.3 of their software suite. Version 13.0 of NASA’s FUN3D CFD solver was released. A ParaView Catalyst visualization of the largest known in-situ simulation. Image from Kitware. See link below. Visualizing Data shares their best of the visualization web for August 2016. EnSight 10.1.6(e) was released with Oculus Rift support and other enhancements. Amazon EC2 now offers GPUs. Last week in Japan I encountered many instances of meshes in real life. Apologies for the poor photography; it is not my strong suit. 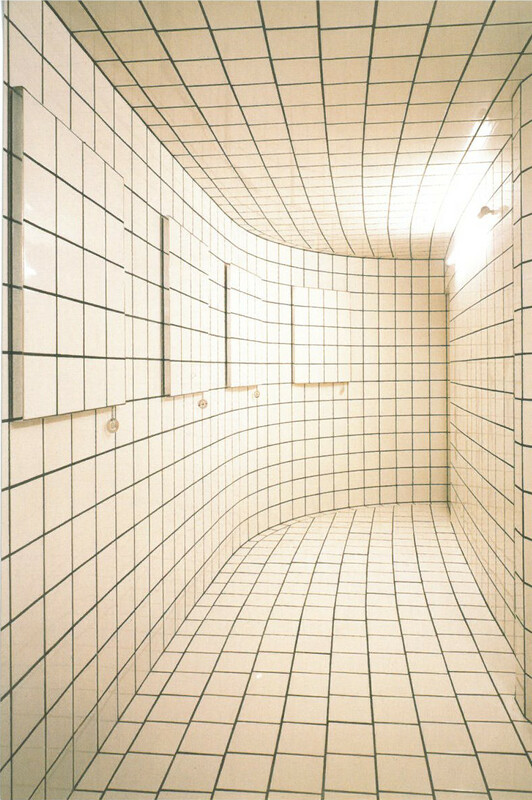 This is Jean Pierre Raynaud’s installation L’Espace Zero in Tokyo’s Hara Museum of Contemporary Art. Being inside this room is oddly disorienting due to the slight curvature and the bright light. 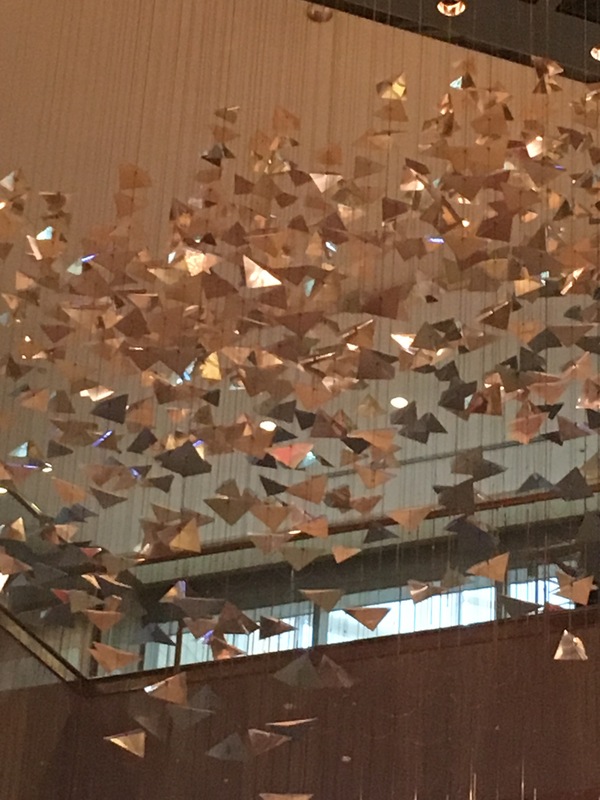 These silvery tetrahedra are dangling from the lobby ceiling of a hotel in Osaka. 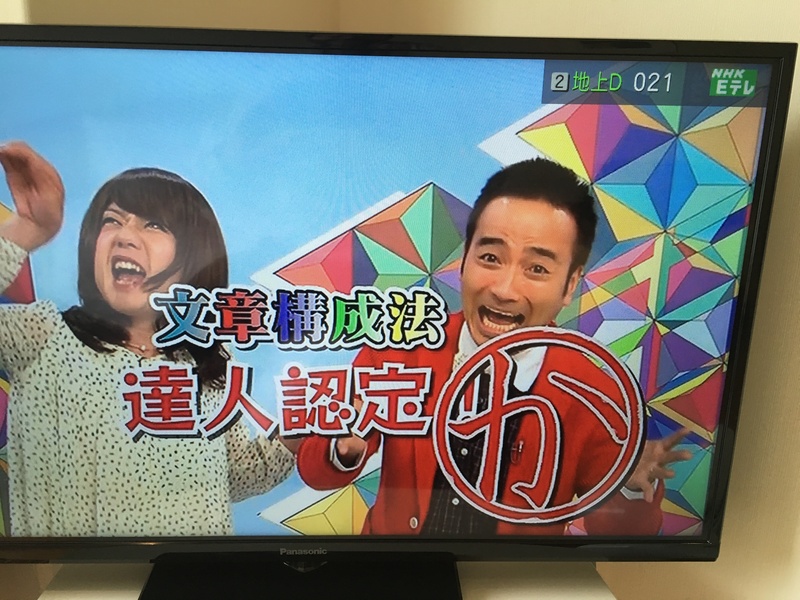 This brightly colored tessellated backdrop is from a Japanese TV show. Bonus: Artist Daniel Hill, whose mesh-like work has been featured here before, is curating an exhibition at Pace University, Visual Inquiries: Artists Inspired by Science. Check it out if you’re in the NYC area before 08 November. Double Bonus: Geometry in movies. Triangles bad. Squares and circles good. This entry was posted in Applications, Events, Hardware, News, Software and tagged Caelus, CAESES, EnGen, EnSight, ESI, FLOW-3D, FUN3D, Kitware, OpenFOAM, OpenQBMM, ParaView, RhinoResurf, SC16, STAR-CCM+, ThinkSOLN, TwinMesh, visualization. Bookmark the permalink.